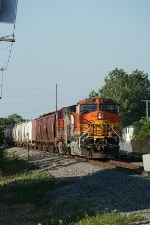 Description: An iron ore special meets a grain train near East Dubuque. Description: BNSF mixed freight exits tunnel under the Gateway Arch and makes the turn toward Chouteau Yard. Description: A pair of C44-9Ws have an Oakway helping lift a tac empty. Description: BNSF 4841 leads an Oakway 60 and another Dash 9 into Old Monroe on New Years Eve. Description: This eastbound at the Canal St. Xing is about to turn from compass north to northeast. It is fairly unusual to see BNSF power amidst a UP consist here. And that is not even good graffiti on the old 60M. Description: BNSF makes an appearance as the first in a 4 unit consist on a 31 car train. Title: Southbound at Tower 55 this BNSF train is heading toward the Diamond as a UP train in the background awaits its turn. Description: 4841 waits for a signal on the IHB at Calumet City, IL. Description: Q349 heads west with a BNSF Pumpkin leading and 2 CP units trailing.